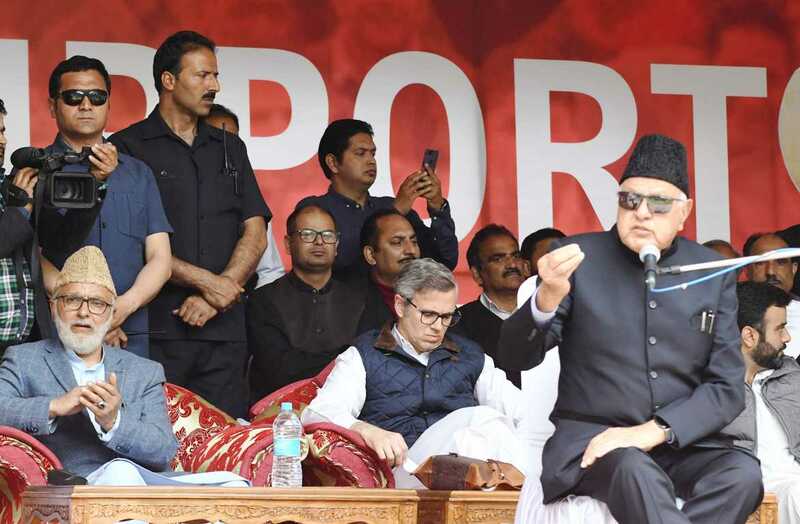 Jammu and Kashmir National Conference President Dr Farooq Abdullah on Monday asserted that PM Modi’s undertaking on winning the hearts of Kashmiris was a lapsed speech saying that never have the people of the state, in particular, the Kashmiris seen such suppression as is rampant since Modi led government came to power in Delhi. NC President Dr Farooq Abdullah, Vice president Omar Abdullah during an election rally in Srinagar. Addressing a mammoth public meet at Sher e Kashmir park in Srinagar, the party president said, “PM Modi has been parroting that Kashmir is the ‘Atoot Ang’ of the country, then why didn’t he address any public meet here in Kashmir, what barred him from doing that? On one hand, he parrots about winning hearts and minds of Kashmiri, but there is a world of difference between his actions and statements. How can the heart be won by banning highways? This is not the way to won hearts?” he said. Applauding the decision of Omar Abdullah and the party of not forging an alliance with BJP in 2014, he said, “I was undergoing my treatment overseas; however, BJP and its cronies had approached Omar sahib and other party members for hobnobbing an alliance. However, the recourse was taken by Omar and other associates of his worth appreciation. The party leader’s had rejected the offer of forging an alliance with those who have the blood of Muslims on their hand. I want to make it clear for all times that Farooq Abdullah will never join hands with those who have the blood of minorities on their hands,” he said. In a stinging attack on BJP, party vice president Omar Abdullah said, “Today BJP are outraged at our undertaking for the restoration of state’s status, they are the ones who used to sit with me in the central cabinet when we got the autonomy resolution passed from our assembly with the majority. Why didn’t they raise any qualms then? We didn’t change our views; we have been maintaining that it is the restoration of autonomy only that will go a long way in removing the cobwebs of mistrust between New Delhi and the state. Our stance remains the same both when inside or outside government,” he said. Among others Haji Ali Muhammad Sagar, Dr Sheikh Mustufa Kamal Abdul Rahim Rather, Choudhary Muhammad Ramzan, Aga Syed Ruhullah Mehdi, Mubarak Gul, Muhammad Akbar Lone, Shameema Firdous, Nazir Ahmad Khan Gurezi, Irfan Ahmad Shah, Pir Afaq, Muhammad Syed Akhoon, Shami Oberoi, Sheikh Ishfaq Jabbar, Sheikh Ghulam Qadir Pardesi, Tanvir Sadiq, Salman Ali Sagar, Showkat Ahmad Mir, Dr Sajad Uri, Aga Syed Yousaf, Sabiya Qadri, Haji Abdul Ahad Dar, Ahsan Pardesi, Younis Gul and Mudassar Shahmiri were also present on the occasion.